#VarunDhawan gearing up for the release of his forthcoming film #SuiDhaaga said he can't wait to share the trailer with his fans. The 'Judwaa 2' actor expressing his excitement tweeted on Sunday, "Cannot wait anymore to share #SuiDhaagaMadeInIndiaTrailer with you all! Watch it TOMORROW! @AnushkaSharma | @yrf| @SuiDhaagaFilm | @SharatKatariya #ManeeshSharma"
He also posted a short video with co-star Anushka Sharam. They both dance to a tune pointing at the film's logo and the announcement, 'trailer out tomorrow'. The film's trailer will be released on Monday via Youtube. The actors earlier had said there will be no trailer launches, posters, and film promotions. Instead, they reached out to local artisans and craftsmen from across the country to create the logo of the film in their unique stitching styles. The 15 unique logos were released on Handloom Day as a video flipbook on social media. 'Sui Dhaaga' stars Varun Dhawan and Anushka Sharma as a tailor and embroidery craftswoman. The film is about finding love and respect through self-reliance. It is said that the plot is inspired by Mahatma Gandhi's philosophy and takes a leaf out of the Make In India campaign. 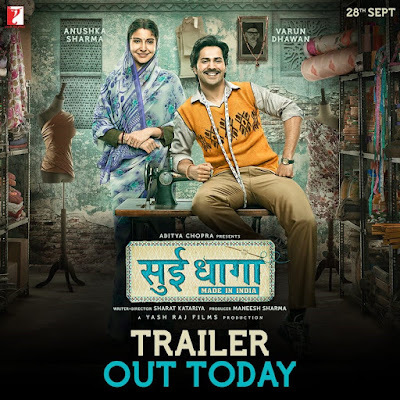 Directed by Sharat Kataria and produced by Maneesh Sharma, "Sui Dhaaga" will release on September 28.